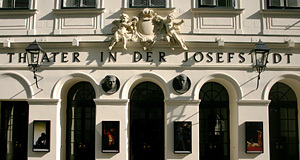 The Theater in der Josefstadt is a traditional theatre in the eight district of Vienna, the Josefstadt. It is situated in a predominantly residential area - the district itself, however, does have a reputation for its dramatic heritage. Colloquially, the theatre is often referred to as simply the "Josefstadt". It was founded in 1788, which makes it by the theatre′s own accounts the oldest in Vienna. I think this claim is rubbish, as the building was designed by Josef Kornhäusl in the course of the theatre′s re-development in 1822, and the interiors were refurbished and modernised repeatedly. However, the "Josefstadt" is a very charming and traditional theatre without doubt. The history of the Josefstadt is closely connected with Viennese celebrities such as Ludwig van Beethoven or Richard Wagner. Both composers are reported for having conducted here at performances in the Theater in der Josefstadt. Local VIPs such as the writers and actors Johann Nestroy and Ferdinand Raimund hat close ties with the theatre - especially as it was situated in the suburbs of Vienna, the "territory" of the two and the area where their "Wiener Volkstheater" found the appropriate clientele. Johann Strauß Senior performed in the Sträußelsäle Halls. The Theater in der Josefstadt became one of Vienna′s most popular theatres - on contrast to the aristocratic (and actually much older!) Burgtheater, it drew the common people, the middle class of civil servants, teachers, clergy. By 1820, the theatre′s audience had grown beyond its capacities and the building was demolished completely (that much about being the oldest theatre of Vienna). The new construction was designed by the Biedermeier star architect Josef Kornhäsl, he of the Stadttempel synagogue and the burgher houses in Baden. He designed the theatre in a typical Biedermeier style. The following decades were the "golden age" of the Josefstadt. In a sense, it became Austria′s first movie theatre when in 1847, the first motion pictures were shown using a "laterna magica" - an invention of the Tryolean mathematician Simon Stampfer. But even today, the reputation of the Josefstadt is at least of national significance and it is among the most popular stages in Vienna. The ensemble of the Josefstadt actors includes many well-known people and the program of the theatre is usually produced with much interest from media and general public. Attractions nearby include a whole bunch of other, smaller stages - the eighth district is a theatre district. The Piaristenkirche by Lukas von Hildebrandt is within walking distance. The Rathaus City Hall is nearby, too, and so are University, the Houses of Parliament and other attractions of the Ringstraße and the Inner City.